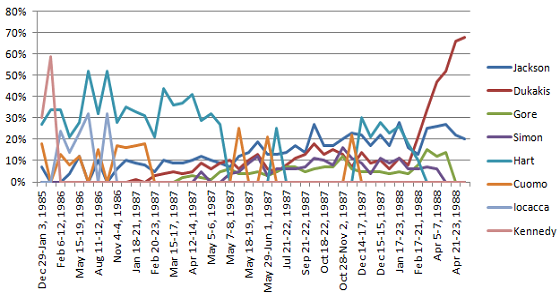 Even beyond the 1989-1990 time span, primary results, as illustrated by polls taken into 1992, did little to reflect the eventual results to come that summer. For example, Mario Cuomo was far and away the 1992 Democratic polling frontrunner throughout 1991. It wasn't until January 1992, as Clinton's name was circulated in the media in association with rumored marital infidelities, that he took the lead in national primary polling. He would only ever relinquish that lead to Mario Cuomo, who, again, declined to ever enter the race. The 1988 and 1976 Democratic Presidential primaries followed a track not all that dissimilar to the tracks taken by Barack Obama in 2008 and Bill Clinton in 1992. In 1988, eventual nominee Michael Dukakis never appeared in presidential primary polling until AFTER the 1986 midterm elections. Even after that, he failed to lead in a national survey until mid February '88, following his New Hampshire primary victory. While Dukakis never really made his move with regards to polling until primary contests had begun, it was 1984 runner-up Gary Hart, and of course, the perennial early frontrunner Ted Kennedy, that dominated the 1984-1986 Democratic primary polling scene. Similarly, in 1975, Jimmy Carter made an unimpressive, low single-digits debut in Democratic primary polling, where he remained until his New Hampshire primary win. That victory propelled his poll numbers from the low single-digits to about 30%, tying him with 1968 nominee Hubert Humphrey. But again, Carter, the eventual nominee and President, was no where on the Democratic Primary polling radar screen in 1973-1974. Those early early polls were dominated by none other than Democratic Senator Ted Kennedy. When those early polls failed to include Kennedy as an option, it was frequently the racial segregationist fire-brand, Alabama Governor George Wallace, who claimed the polling frontrunner mantle. And by late 1975, even former Vice President and 1968 Democratic nominee, Hubert Humphrey, had notched several national polling leads of his own. 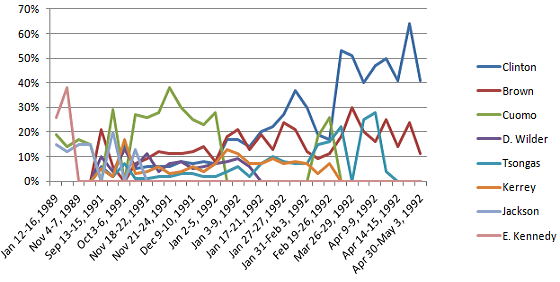 The early 1976 Republican Presidential primary polls looked as radically different as the final result as any primary in any party, though for very different reasons. After Nixon's landslide re-election in 1972, it wasn't immediately clear that a major scandal was about to engulf his presidency. And early primary polling from 1972 and 1973 reflected that - disgraced ex-Vice President Spiro Agnew, forced to resign from office in 1973, was the early 1976 GOP nominee polling frontrunner. Even recently re-elected California Governor Ronald Reagan led a survey or two as Agnew's political future collapsed. Upon his taking the oath of office in late 1973, Gerald Ford quickly shot to the top of most 1976 GOP primary polling, often times leading his 2nd place opponent, Ronald Reagan, by significant margins. It may come as a surprise to some that despite the relatively close final popular vote in the historic 1976 Republican primary showdown between President Ford and former Governor Reagan, Ford never once lost his national polling lead, even as he lost such important primary contests as North Carolina, Texas, and Georgia. In fact, the only time Ford lost his polling lead came in a single December 1975 Gallup poll following Reagan's official entry into the race and Ford's controversial cabinet shake-up. And finally, John Kerry's path to the Democratic nomination certainly didn't stand out in anyway, at least not until his impressive Iowa Caucus victory. Al Gore, fresh off a gut-wrenchingly close electoral college loss, and narrow popular vote victory, seemed an obvious contender for a 2004 rematch. Early polls reflected this, as he dominated in Democratic primary surveys taken in 2000 and 2001. Kerry was on the radar, but he was barely a blip, polling in the low single digits. And recently elected New York Senator Hillary Clinton seemed more likely than Kerry or anyone else to pose the most serious threat to a potential Gore candidacy. 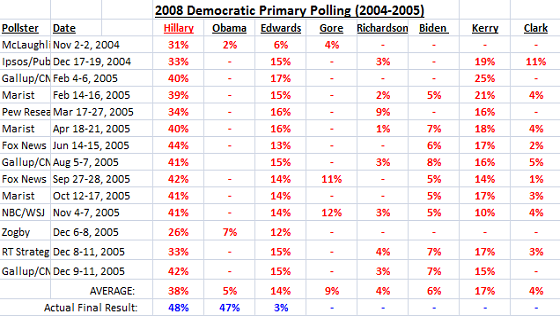 Not only was Gore the very early 2004 Democratic favorite, his national primary polling dominance continued until the 2002 midterms, when he announced he would not be a candidate for President. Once he was gone, it was his 2000 VP nominee who stepped in to fill the void, as Senator Joe Lieberman began a near-year-long national polling lead (with the exception of those surveys that included Hillary Clinton as a potential 2004 candidate). It was this late 2002-late 2003 period in which John Kerry's stock rose, as he became a frequent runner up to Hillary Clinton and Joe Lieberman in national polling. 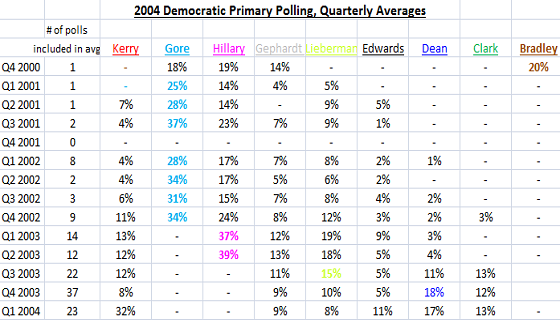 Then came Wesley Clark, who led the polls for a brief period in the early fall of 2003. Howard Dean's reign atop the 2004 field began in late October 2003, and lasted until his implosion following the Iowa Caucus. Following Iowa, John Kerry never looked back, and the rest was history. So there you have it. Nearly 40 years worth of Democratic and Republican primary polling, and it would appear that surveys conducted in the first year or two following the preceding presidential election are rarely predictive of actual outcome. 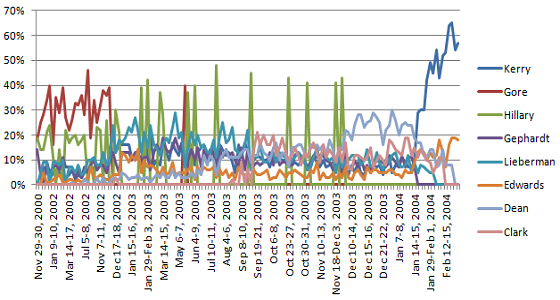 What does that mean with regards to the 2016 polls we've seen to date? Well, given the inconclusive, topsy-turvy nature of the 2016 GOP contest, it's hard to say. Taking Chris Christie's rapid fall into consideration, we should be weary of jumping to conclusions if Jeb Bush, or say, Ted Cruz, or anyone else breaks away from the pack sometime this year. 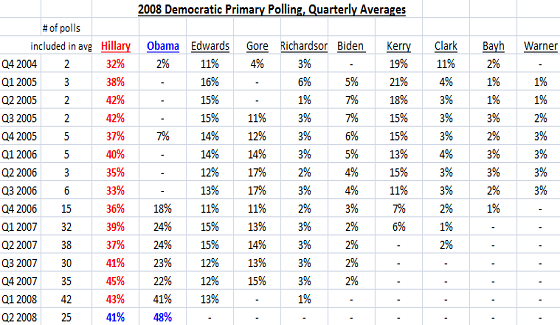 History suggests their early poll lead won't likely give them the nomination. For the Democrats, the lesson learned is a little less clear. Obviously, past early primary polls suggest Hillary loyalists shouldn't get too confidant about their candidate's present poll standing. Though let's be honest, as Parts 1-6 of this series have shown, no candidate in a contested presidential primary since 1976 has ever achieved national primary polling dominance like Hillary Clinton has. And data-nerds tend to agree. As mentioned before, Al Gore in 2000, Bob Dole in 1996, and George H.W. Bush in 1988 were the only clear polling frontrunners for their entire respective primary polling cycles to go on to win their party's nomination. If she runs in 2016, Hillary Clinton seems highly likely to become the fourth.